Another brutal season of forest fires has started in Western Canada. I hear about fires in Australia and sections of California occasionally. Are forest fires as big a deal elsewhere? The Fort McMurray evacuation has prompted my question. It is 100% of the national news in Canada right now. They were a big deal in our landscape architecture businsess, a couple of those in the general Los Angeles area. It started with our schooling re the right plants but also with city and fire department advisories. One of my clients, in the Malibu area (near the ocean) had a fairly large acreage, and was lucky that the fire stopped just before the house, stopped by a large planting of the one of the tallest Oleander trees. She called me after that, re replanting; she was an interesting woman, wrote a book about manatees, my friend as a fellow taker of adult learning italian classes. When I was still at university, the Bel Air fire got to within five blocks from our house - scary stuff. So, yes, I'm pretty tuned in to fire stories. Also their aftermath in some areas: massive mud slides after the rains come around. There are things to do re your house for protection, but I don't remember all of it right now. It was less of a deal when I moved to coastal northern California, but that was just an area that was in better shape, fire wise, than my southern California experience. There are fires in New Mexico too, but I know less about that. So far, so good. Edit - there was a good booklet put out by a fire expert, Klaus Radke, but it is likely out of date by now. Lots of useful advice. lots of links there re his books. Large forest fires rarely happen in the UK. Now and then during a major heatwave and drought (very rare occurance) we might have patchy fires here and there. The last major one I remember was all around Ringwood (New Forest), maybe twenty or so years ago. I've just been watching this on the beeb. Jeezus. Is this worse than normal? Average? It looks like judgement day. Last year was a particularly bad fire year. 'The Fort Mc fire is a big deal because it's early in the season and it's a bigger community than usual that is being evacuated. If you can get the CBC radio feed on your computer give a listen. It's unbelievable. Yes. I remember the anguish over the animals, besides the humans. I'll try to catch it, but probably not with my computer. So scary. Hope the people managed to take all their pets and livestock. You must have fire breaks etc built into the grand scheme of your forestry. Maybe they need to establish bigger breaks/barriers for the future? Water barriers such as dams, reservoirs etc? You can't keep having this situation every year. 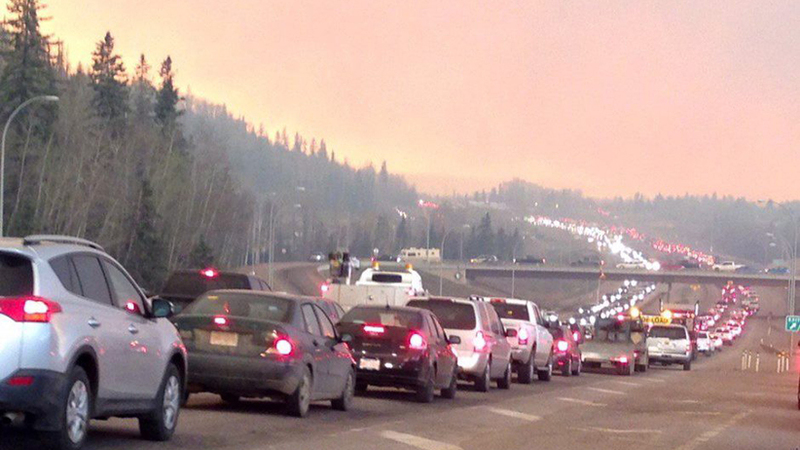 I knew it was really bad when they said on the CBC that the disaster response center in Fort Mc had to be evacuated, and they were hoping everyone got out. They're trying to get everyone in the city to evacuate. We have been too waterlogged, of late. CBC has now said that Fort Mc is empty, except for emergency services personnel. There has been one fatality--a car accident during the final evacuation. The spaces are just so freaking enormous. There are fires that are sometimes bigger than small European countries. Hard to have country-sized fire breaks. They're not expecting rain for another 5 - 7 days. Worst of the fire for Fort Mc is expected to be tonight. It's just horrendous. People talking about driving past exploding gas stations. Welcome. Oh brave new world. I thought that after I posted. Having lived on an Island about the size of a medium sized Australian sheep farm all my life, I think that 15 miles is a vast distance. I shall now send vibes for a 24 hour rainstorm. A large crew of Mexican firefighters arrived in Fort Mc yesterday. Will have to see if there is news of any Australian firefighters. The fire evacuation area expanded overnight.